The worship of God in the form of Mother- is a unique Feature of Hinduism. Through the ages, the doctrine of the Motherhood of God has established a firm root in Hinduism. Today Hindus worship the Divine Mother in many popular forms such as Durga, Seeta, Kali, Lakshmi, Saraswati, Ambika, and Uma. By worshipping God as the Divine Mother, a Hindu can more easily attribute Motherly traits to the Lord, such as tenderness and forgivingness. The natural love between a Mother- and her- child is the best expression of the Lord’s unconditional love for- us as children of God. In the most representative Hindu view, the universe is the manifestation of the creative power (shakti) of Brahman, whose essence is absolute existence, consciousness, and bliss (or in Sanskrit, sat-chi t-ananda). 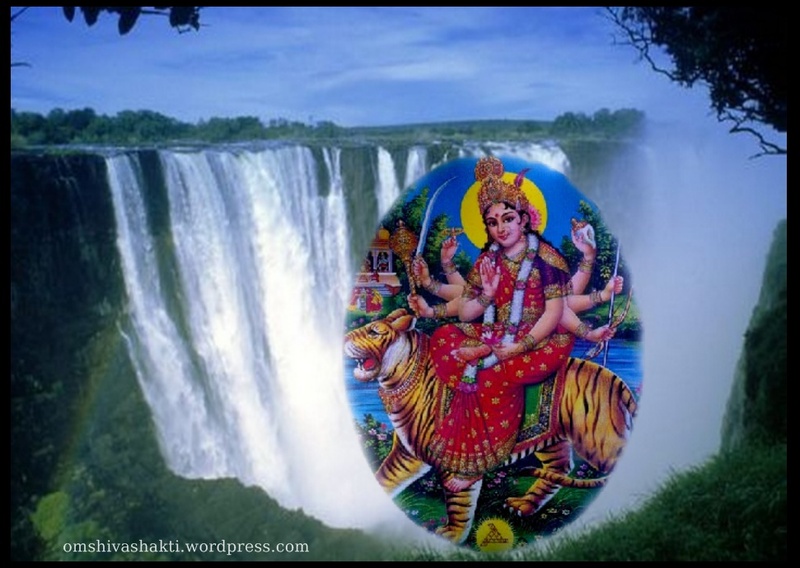 Since all created forms proceed from the womb of the mother, the creative power shakti) of God is recognized by Hindus as the female principle or the motherly aspect of nature. In this sense we are all children of the Divine Mother. We are contained by Her before our – manifestation and nourished by Her throughout our existence. To a Hindu, the motherly aspect of God in nature is full of beauty, gentleness, kindness, and tenderness. When we look upon all the glorious and beautiful things in nature and experience a feeling of tenderness within us, we feel the motherly instinct of God. The worship of God in the form of Mother is a unique contribution of the Hindu child. When a devotee worships God as Divine Mother, he or- she appeals to Her tenderness and unconditional love. Such love unites the devotee with God, like a child with its mother. Just as a child feels safe and secure in the lap of its mother, a devotee feels safe and secure in the presence of the Divine Mother-. Pararnaharnsa Sri Ramakrishna, one of the greatest Indian sages of modern times, worshipped the Divine Mother Kali during his entire life. He established a personal relationship with Her and was always conscious of Her presence by his side. Through the worship of God in the form of Mother, Hinduism offers a unique reverence to womanhood. The Devi Mahathmya or the Durga Saptasati is a unique book in this world. It is the base and the root of the religion of the Saktas. This Sacred Book is known by various names in Bharata Bhumi as Devi Mahathmyam in South , Chandi Paath in East , Devi Bhagvat in West and as Durga Saptashati in the Northern & Central parts of the country including Varanasi. One of the eighteen Puraanas ” The Devi Puraana”composed by Bhagvan Shri veda Vyasa is also called Sreemad Devi Bhagavad.The Srimad Devi Bhagavatam, also known as Devi Purana, was composed into 12 chapters, containing 18000 verses by the great Veda Vyasa. Shri Devi Mahathmyam is a Kamadhenu for one and all; it gives whatever man wants. It gives Bhakti in this world and Mukti afterwards. It is a powerful reservoir of Mantras from the beginning to the end. Every verse of this text is a dynamic force which acts powerfully in overhauling the nature of man. The first verse of the text implies that the whole book is an explanation of the root of the Devi-Mantra, viz., —Hreem. The nine forms of Durga – Shailputri, Brahmacharini, Chandraghanta, Kushmanda, Skandamata, Katyayni, Mahagauri, Siddhadhatri,and Kalratri, are envisioned with the great goddess. She assumes these manifold forms of Shakti . There are many commentaries on this text which explain it in a mystical way . These Powerfull Mantras of the Saptasati are not to be neglected by one who wishes to lead a good and peaceful life in this world. May the blessings of Devi shower on all of us…Om ShivaShakti.